ROBERT DE VAUGONDY -Carte des grandes routes d'Angleterre, d'Ecosse ... Irlande. ROBERT DE VAUGONDY - Carte des grandes routes d'Angleterre, d'Ecosse ... Irlande. 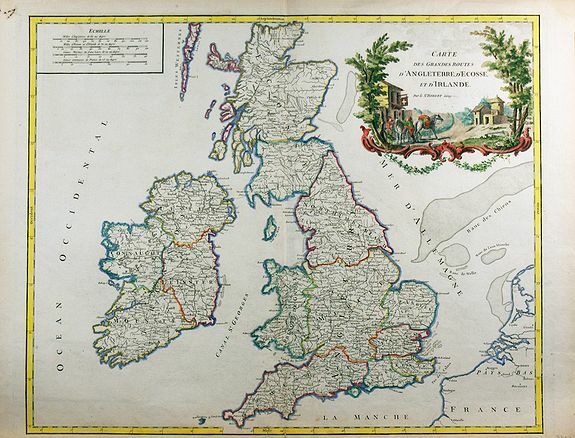 Title : Carte des grandes routes d'Angleterre, d'Ecosse ... Irlande..
Map maker : ROBERT DE VAUGONDY. Sponberg Pedley, Bel et utile, 45, state 5. Condition : A few very small whormholes on the upper part of the engraving, along the centerfold. Otherwise in very good condition.